When it comes to serving fresh food to our family of customers, we never compromise. We pride ourselves in giving our Dining Directors, Managers and Culinarians total flexibility and autonomy to do what's best for your campus community. Food excellence is only attained through the perfect execution of the culinary basics. 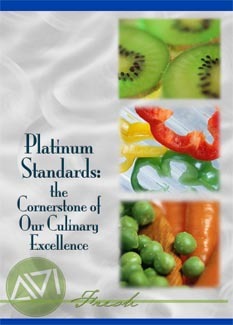 We have identified core culinary competencies and have created a "Platinum Standard" for each. It is by these standards that we support a culture committed to culinary excellence. Platinum Standards along with our core culinary values have been created to ensure the highest level of food quality for our guests. Our food is batch cooked using the "a la minute" philosophy. This means that food is prepared in small quantities at the last minute. In most cases, foods are cooked to order for each guest. Our mashed potatoes are made only from fresh potatoes, never instant. Every menu in our dining program is custom written for each client based on regional preferences and seasonal availability. Our Guests can find a vegetarian selection from each concept in our dining program. Cookies, muffins and pastries are baked fresh daily from scratch. We do not add MSG to any of our recipes. We use an electronic production system to manage the food production process. Food is a valuable resource and is not to be wasted. Deep-fried foods are cooked in non-hydrogenated oils. Whenever possible, alternative cooking methods other than fried are offered. All soups are made from scratch, never canned or frozen. We use only fresh mushrooms, not canned. We use only fresh fruit, not canned. Only dolphin-safe tuna is used in our recipes. Food is only purchased from inspected and approved sources. Culinary team members use recipes to ensure quality, consistency and nutritional accuracy in the food that we serve to our guests. We bake our wide variety of breads fresh on premises every day, starting from scratch — you'll never find us using frozen dough. All of our delicious pies, cakes and cookies are baked throughout the day for a taste that's undeniably fresh. We use only the finest, freshest meats for our grilled burgers and sandwiches. All of our Grill items are made to order, ala minute, not made in advance. We treat The Grill the same way we would our own family barbecue — and that means fresh! We pride ourselves on our pizza! Our dough is made daily on-site using the basics... flour, sugar, salt, yeast, olive oil and local water. Try our Honey Wheat crust for a healthy change! Our pastas are cooked fresh every day and our special sauces are made from scratch or speed scratch. Whenever possible, we'll always use fresh vegetables in season, not frozen. If fresh vegetables are not available and we must use frozen, we make sure that they're the best possible quality. Cooking methods include sautéed, grilled, roasted, steamed or braised. We partner with local farms and dairies whenever possible, ensuring their standards of food quality by employing our third-party auditors. Our "T&B...Naturally" coffee is 100% certified organic and shade grown from our partner-growers in Central and South America. Our Swiss steak cutlets are hand-cut from whole top rounds of beef. All beef and turkey for the Deli are slow-roasted and sliced in-house. To compliment our freshly roasted meats, our mashed potatoes are made from scratch, so you may find a lump or two because they're real! Our International recipes are thoroughly researched and tested extensively to ensure authenticity. For example, we hired a consultant-Chef from China to help us develop our Mongolian Grill program. The lettuce for our salads is hand-cut and washed in small batches as needed — not from a bag or prepared in advance. That's why our lettuce tastes like lettuce, not a plastic bag. Dressings are made fresh from our own recipes, because we like our recipes the best! © Copyright 2012. AVI Foodsystems, Inc. All Rights Reserved.